So what do you do with all the small pieces of handwoven fabric from sampling and weaving off a warp? Small bags with and without a strap are one possibility. Happy Holidays to all, and may your New Year be filled with many fiber related projects. By changing color schemes a pattern can look totally different. 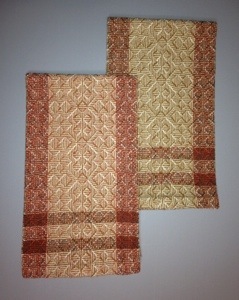 These shadow weave towels were inspired by the fall leaves on the Bradford Pear Trees in our neighborhood. They’ve just begun to change, but memory has served me well. These are woven with 8/2 cottolin, using a total of 5 colors. They are sett at 20 epi, 2 ends per dent in a 10 dent reed. I tied onto the warp of the pumpkin towels of an earlier post. These will be the last towels for a while, need to change gears and get a holiday gift project on the loom. Inspiration for these shadow weave towels come from the pumpkins seen everywhere at Halloween. Usually I use cottolin for shadow weave towels. For these 8/2 cotton is used with the same sett as if using cottolin, 20 ends per inch. A ten dent reed is used with 2 ends per dent. Weaving is done with 2 shuttles. 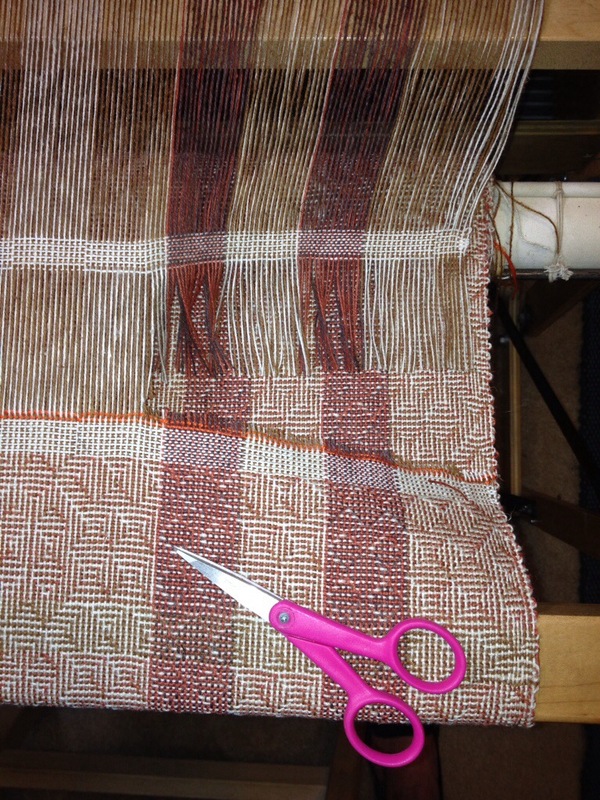 The third shuttle was used when weaving the stripes at the base of the towel. These zinnas could have been used for inspiration instead. This picture was taken on a much sunnier day than today. Happy Halloween to all you ghosts and goblins out there. One of my favorite weave structures is Shadow Weave. In traditional shadow weave every other thread is a dark color followed by a light colored thread. 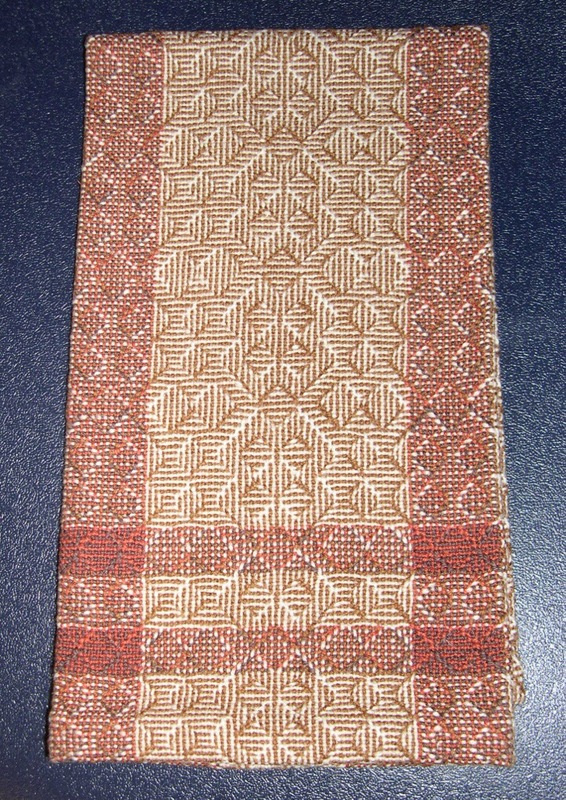 This is done In both the warp and weft directions. The light color is the shadow. 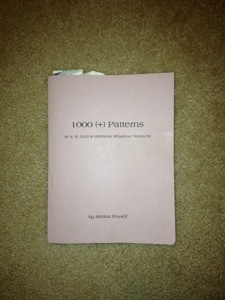 My go to book for shadow weave is 1000 (+) Patterns in 4, 6, and 8 Harness Shadow Weaves by Marian Powell. With the many variations shown in this book it is easy to put together your own combinations. The towels are woven with 8/2 and 22/2 cottolin, sett at 20 ends per inch, 2 ends per dent in a 10 dent reed. After weaving the last towel on this warp I weave a header about an inch in length to hold the warp threads in place when I cut the warp between the header and woven towel length. After removing the woven towels from the front beam, the tying on of the new warp begins. The new warp is spread on lease sticks between the front beam and the beater. 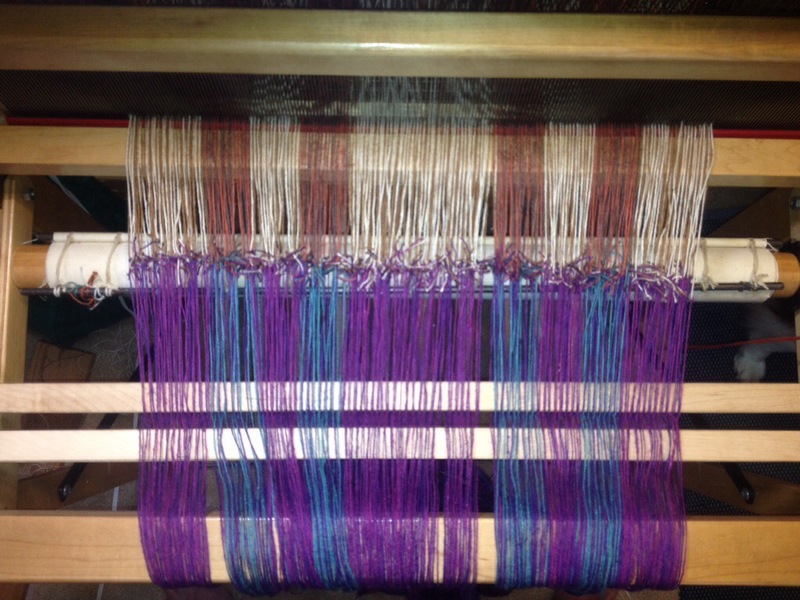 This is a side view of the loom front, showing the lease sticks with the new warp on them. The lease sticks keep the new warp threads in order by holding the cross in place. Do not pull the beater forward during this process. The first old warp thread is pulled out of the header and joined to the first new warp thread with an overhand knot placed approximately 1/2 an inch from the warp ends. Continue knotting the old warp to the new in this manner using the next new and old warp threads. Since this is a shadow weave pattern I’m also checking that a light old warp is knotted to a light new warp and an old dark warp to a new dark warp. The new and old warps are all tied together. it is now time to gently pull groups of warp yarns through the reed and then through the heddles. If there is any resistance stop and check that yarns are not tangled. Once all the threads are pulled through the heddles you are now ready to wind the new warp onto the back beam. Next, Remove the lease sticks and tie the warp onto the front apron. Your new warp is ready to begin weaving. 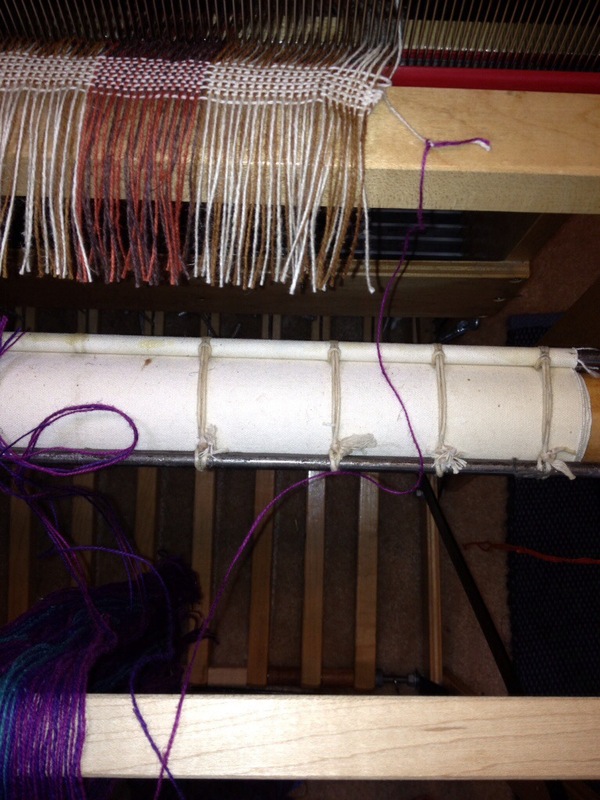 Took a break from weaving to prepare 2 warps. 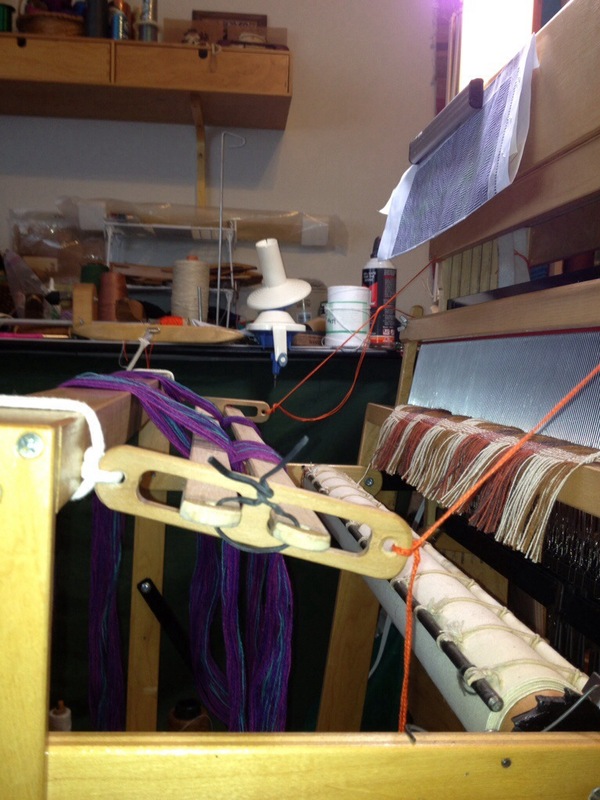 The warping board has several guide strings hanging down that are for different warp length measurements. 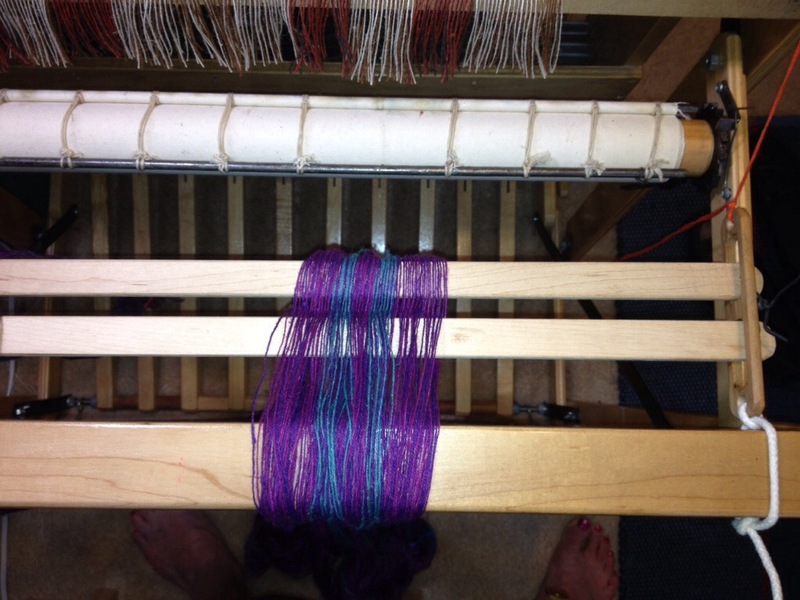 Each of the warps pictured, will be woven as 8 harness, shadow weave towels. The grape or purple warp will be tied to the end of the fall leaf colored warp, after those towels are woven and cut off. 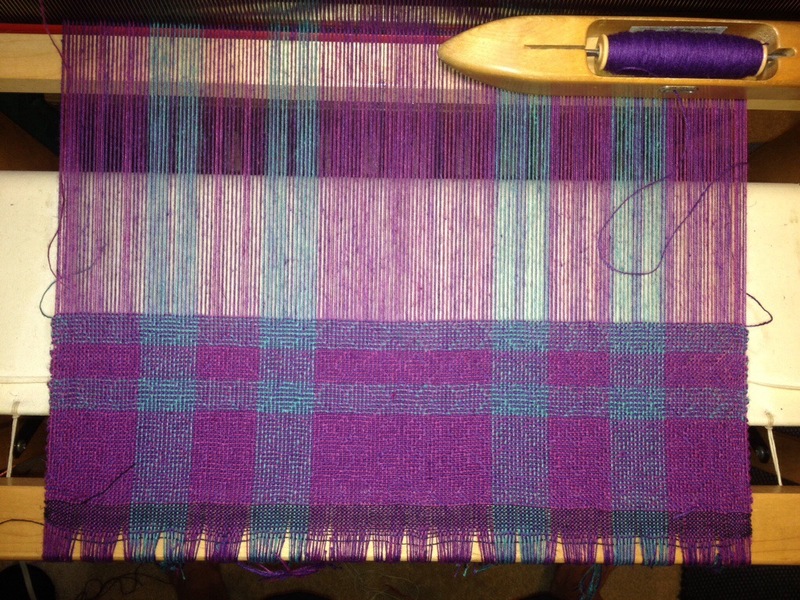 Tying on to an existing warp takes just as long as setting up the loom initially, but there is one benefit there will be no threading errors or denting errors. This shows my new yarn storage shelves. Half of the yarn had been in boxes, bags or simply stacked in a closet. Of course the yarn I always wanted was on the bottom of the pile. My husbands solution was to increase my shelve space. So all the yarn was taken off existing shelves, to move in the new shelves. The yarn is sorted by type and color when possible and placed on the new shelves. This is the real reason I couldn’t weave this weekend, The loom was surrounded by yarn. So I warped instead.